If you want a good excuse for a party this Tuesday, it’s Bill Monroe’s 100th Birthday. “The Father of Bluegrass” was born on September 13th, 1911. He passed away on September 9, 1996. 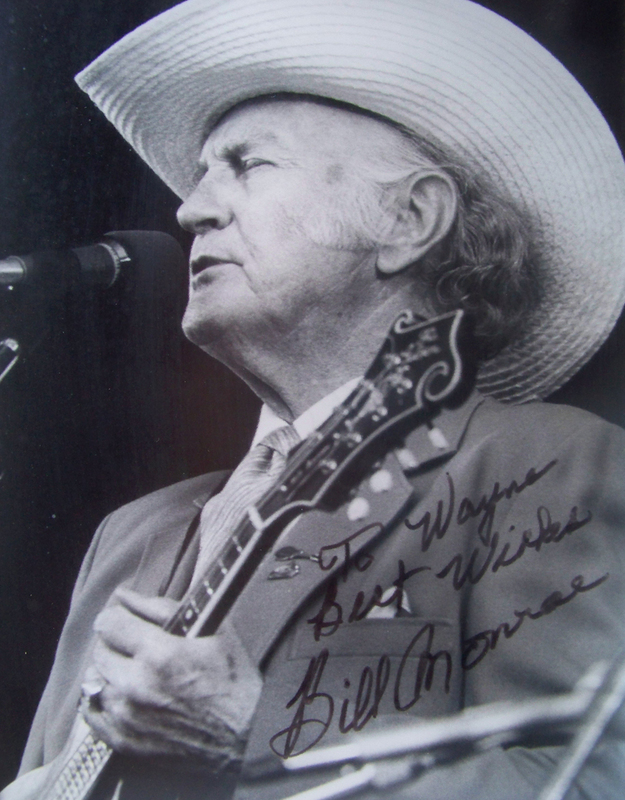 In case you aren’t familiar with Bill Monroe, you are most certainly familiar with the music he created. He was a singer and mandolin player from Kentucky who in 1939 formed an ensemble called the Blue Grass Boys (named to honor his home state) and after experimenting with various combinations of instruments and vocal styles, he found success with his legendary 1945 combo which included Lester Flatt on guitar, Earl Scruggs on the banjo, Chubby Wise on fiddle and Cedric Rainwater playing bass. 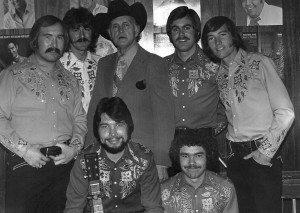 The early recordings and performances by that band took the world of country music by storm and spawned dozens, then hundreds, and today thousands of bluegrass bands all over the world. Well, I could go on and on about Bill Monroe (“On and On” is the title of a Monroe song, by the way), but I’ll let you look him up on Wikipedia or something. I’m just honored that I had a chance to meet him and work with him on a few occasions. One of my prized possessions is a photo of him that he signed for me which hangs on my wall at home. 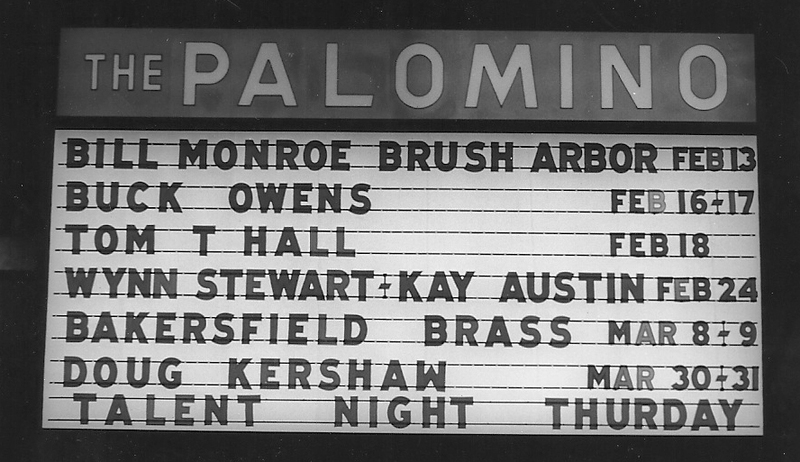 When I was in the band Brush Arbor, I’ll never forget the night in 1973 when we opened for Monroe at the world famous Palomino Club in North Hollywood. The room was packed with celebrities and many of my musical heroes at the time who had come to hear Monroe, not us. I remember seeing Clarence White of the Byrds sitting up close and Carl Jackson, who was playing banjo with Glen Campbell at the time. Backstage I chatted with Del Shannon who had hit songs like “Runaway” and “Hats Off to Larry.” Of course, the biggest thrill was hanging out with Big Mon himself, who was bluegrass music royalty. I remember just how kind he was to us despite the fact that we had drums and steel guitar in the band (a no-no to most bluegrass fans). He gave us an open invitation to play at any of his bluegrass festivals around the country. We did get to play at one of them. 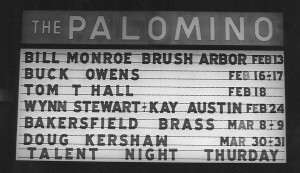 When we took the stage at the Palomino, we kicked off with our version of “Proud Mary” which is really really fast. I kicked it off on the banjo and about four bars into the song, my thumb pick just popped off my thumb and flew out somewhere in the audience. I was stunned. Everyone looked at me like “what are you going to do now?” and I really didn’t know. My brother Jim grabbed a thumb pick out of his stash on stage and I was back in business right away and the song went on. But I broke into a flop sweat that just soaked my rhinestone-covered Nudie suit. Sooo embarrassing. I never got my thumb pick back. Happy birthday Bill Monroe! Thank you for the amazing music you created which absolutely swept me off my feet almost 50 years ago as a teenager and which continues to bless my life in so many ways today. I thank God for you and remember you with deep appreciation on your centennial year. 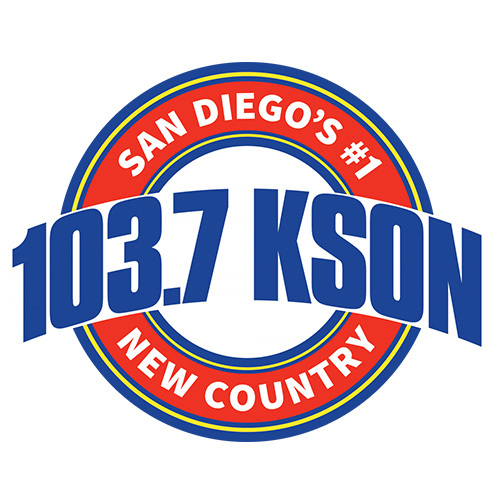 If you would like to hear my radio show which I did Sunday night (9/11) to celebrate Bill Monroe’s 100th birthday, go to www.kson.com/bluegrass. It will be there for about a month so if you are reading this after October 15, you probably won’t be able to hear it. This entry was posted in Bluegrass, KSON's Bluegrass Special and tagged Bill Monroe, Bluegrass, Brush Arbor, kson. Bookmark the permalink.